A Lovely Little Life: Third Trimester! How Far Along? 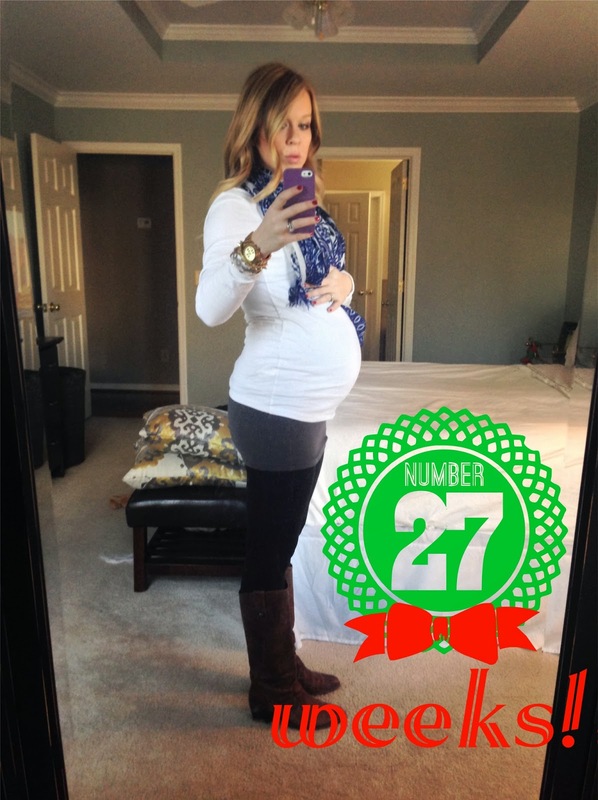 27 weeks - Third Trimester!! Holy Crap!! Weight Gain? I am at 18, ladies! 18! That's a little less than E, so I am still doing good though! Stretch Marks? Lathering and lathering, hoping I can make that one disappear and not get anymore! Sleep? It's crap these days. The insomnia is a awful. I am so sorry, so I get in bet early but then I am WIDE awake. So frustrating. Hoping to catch up over the holidays! Movement? yes, the little bug moves so much more than her sister did....which hubs says means she is going to be our wild child....oh joy! HA! Anything making you queasy or sick? any kind of fish, bleh. Labor signs? Just a few Braxton Hicks here and there. Belly button in or out? getting much flatter! What I Miss? wine at all these holiday parties! Symptoms? heartburn is really my only complaint, otherwise I am feeling really good! Happy or Moody? Happy Happy!! It's the holidays!!! Our 27 weeks were soo similar! I had insomia, baby is measuring a week and 2 days ahead and I had "gained" more because if my air cast. Craziness!! Haha. Hope your sleeping gets better!! You look great!! sushi?! Thought this was a no no? You look SO good! Do you work out while being prego?! I mean I know some is preferred, but you look awesome!! Oh my gosh. I remember finding out that I was pregnant and realizing that it meant I had to stop visiting my favorite sushi place as often as I wanted. I literally cried. But a little bit is just fine. Especially in your third trimester. Go for it and enjoy it mama! You look so freaking cute by the way!!! !